Rudolf Reiss explains how he restored a Collins 30L-1 damaged by flooding last year for RAST during the December meeting. 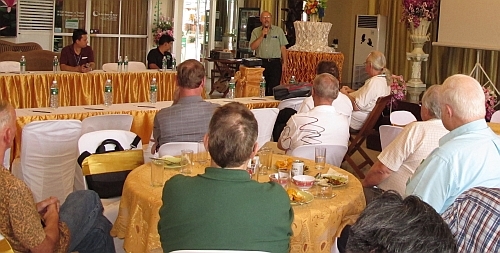 Around 30 members and guests attended the December RAST meeting at N-Siri Resort & Hotel in Lumlukka on December 2, 2012 when RAST President Pornchai (Joe), HS2JFW briefed those present about RAST's participation in the IARU Region 3 Conference in Vietnam and the recent SEANET Convention in Kuala Lumpur. He also gave details about the Intermediate Class examination in Pathum Thani last month and outlined discussions with the National Broadcasting and Telecommunications Commission (NBTC) about new regulations to govern amateur radio in Thailand. Introducing himself at the meeting was Chuck, W3HDN, a newcomer to Thailand who plans to settle in Udon Thani in the Northeast in 2014, while returnees included John, W2YR/HS0ZDJ and Fred, K3ZO/HS0ZAR. 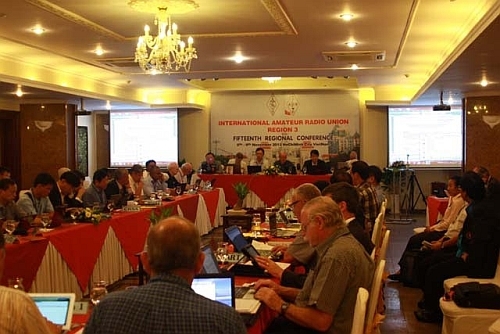 The IARU Region 3 Conference was held in Ho Chi Minh City from November 5-9 and four delegates from RAST participated in the event, which is held every three years. The RAST President began by recalling how, at the November meeting, Jakkree, HS1FVL, Dr Noppadol, E20MIO, Champ, E21EIC and his XYL Goy, E20NKB had been absent since they were on their way to Ho Chi Minh City at the time to attend the IARU Region 3 Conference there. The event, held from November 5-9, had been a success and Champ, E21EIC provided members with a brief summary. During the conference, delegates from 16 IARU member societies and IARU officials had agreed to increase the number of directors from five to six and voted to increase annual subscriptions from member societies by 20 percent while appointing regional co-ordinators. They also made provisions for IARU Region 3 officials to attend meetings of the Asia Pacific Telecommunity (APT) conference preparatory group for WRC-15 and introduced an annual award for the highest individual score in the annual IARU Radiosport contest in memory of the former IARU Chairman Michael Owen, VK3KI-SK. For a more detailed report, please follow this link. The next regional conference will be hosted by the Indonesian amateur society (ORARI) in Jogjakarta in three years' time. 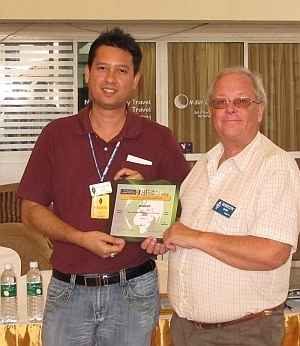 Images of the IARU conference and the SEANET Convention were projected onto a screen during the meeting while Fred, K3ZO/HS0ZAR, (pictured at left presenting a SEANET Plaque to RAST President Joe), was invited to say a few words about the SEANET Convention in Kuala Lumpur which he had participated in as a delegate. Fred noted how the coming together of many nationalities, religions and people wearing many different forms of traditional dress (as were being depicted in the photographs being displayed) symbolised the spirit and diversity of amateur radio. The RAST President then announced some developments around amateur radio in Thailand following a meeting of the NBTC last month to which RAST had been invited when proposed changes to the regulations that govern the activity were discussed. This included band plans and spectrum assignments, a revision of power output limits, privileges for novice and intermediate class amateurs and proposals to issue advanced class licences as well as to address concerns about the high cost of type-approval for new equipment. Regarding the assignment of additional radio spectrum for amateur radio operators, the NBTC reportedly has said that there should be no problem where amateur radio is the primary user of frequencies in the VHF and UHF spectrum, but where the frequencies are a secondary allocation to amateur radio or if the spectrum is shared then only segments of such bands may be allocated, or this spectrum may be allocated later on. As for the 50 MHz band (six metres), Pornchai said that there was one television relay station in Ayutthaya that was still using this band and once this station had moved to another frequency, which should happen next year, then this band could be allocated to amateur radio on an exclusive basis. As for an expansion of two metres (now 144-146 MHz) at first an additional 500 KHz would be allocated (making the upper limit 146.5 MHz) and this might be expanded to up to 147 MHz later on. There may well be an increase in the maximum power output allowed. 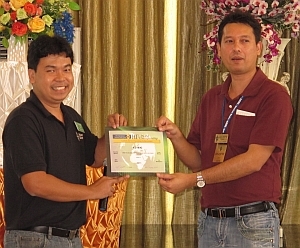 Pornchai said that RAST had proposed it be increased to 1.5 Kilowatts on the HF bands for intermediate class licence holders and raised to 1 Kw for the VHF bands, with novice operators being restricted to 100 watts. A new syllabus is being drawn for an exam for the advanced class licence while RAST has also proposed that novice operators be able to operate in the 10-metre band, he said, adding that it was also possible that novices may receive permission to operate in the 40-metre band as well. There was also a discussion about type-approval issues for equipment, he said, and it had been proposed that where FCC type-approval for an amateur radio transceiver had been granted then Thailand might merely accept and endorse this approval. As for the recent Intermediate Class examination conducted at Bangkok University in Rangsit on November 10-11, a total of 110 candidates had sat the exam, with 32 of these having passed the Morse code send and receive tests and these candidates were now awaiting the results of the theory test. The RAST President mentioned that there had been some timing problems with Morse code sending on the first day, but these had been resolved by the second day. It has also been proposed that the Morse code sending exam be dropped and that the Intermediate Class exam be scored in a different way. At present, there are three components: theory, Morse code receive and Morse code sending and candidates must pass all three parts. In the proposed revision there would be just two components and scoring on a points basis, with theory (75 points) and Morse code receiving (25 points). In order to pass, a candidate would need to score 75 points, so a perfect response to the theory questions would enable this alone. 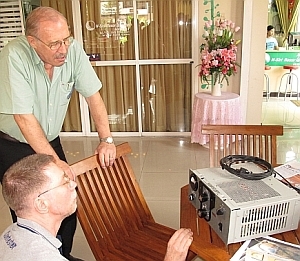 Rudolf Reiss, HS0ZEA, (pictured standing at left with Manfred, HS0ZEU who had helped restore the meter) travelled down from Udon Thani to present a Collins 30L-1 amplifier (seen in the picture) that he had restored for RAST after it had suffered flood damage at HS0AC last year. He explained that after removing the parts and cleaning them he had found the transformer to be Ok. However, he also discovered that the front-panel meter had been totally destroyed so he used a similar one from his stock in Austria and then adapted it work with a scale designed by Manfred, HS0ZEU on his computer. Rudolf also donated four Svetlana 811A tubes before completing the work and now the unit looks fine (and works well, we are assured) and Pornchai thanked Rudolf for his good work. Asked about progress on the HS0AC club station at N-Siri Resort, the RAST President said that the location of the tower had been agreed upon and that the engineer had been contacted to work on this, with construction likely to begin at the end of December or early in January and he said that work on the station should be completed in time for the major contests next year. Radiosport HF Championship, with the winners being Sam, HS0ZDY in the CW category, Charly, HS0ZCW in the phone category and Champ, E21EIC for mixed mode, low-power. All won as single operators for both Thailand and Zone 49.
would report back on this. Please check with this web site for more details and if you would like to receive email updates from RAST, please send a note to tony.waltham(AT)gmail.com. RAST QSL Manager and committee member Champ, E21EIC travelled to both Vietnam for the IARU conference and Kuala Lumpur for the SEANET Convention last month and at the time of writing this he is due to take off to Cambodia to take part in a Foundation for Global Children (FGC) DXpedition led by Zorro Miyazawa, JH1AJT, KH0WF along with Jay Oka, JA1TRC, KH2J, Aki Seko, JA4EKO, ZL1GO, Masaru Hanazaki, JA5AQC and Kazu Fujita, JH1OGX, VR2KF. The DXpedition, from December 5-17, is to support a vocational training centre for persons with disabilities, especially landmine victims. The centre teaches skills such as repairing radio, TV and motorcycles so that they can become an active member of society and can be self-supporting. The DXpedition team will include some members from the 1998 XU1A DXpedition for a reunion and three stations will be QRV on 160m-10m (and possibly 6m) on CW, SSB and digital modes. At the meeting, Champ said he would be on 7-MHz at 13.00 for contacts with HS/E2 stations. Members and guests attending the November RAST meeting at N-Siri Resort & Hotel were briefed on preparations for the upcoming Intermediate Class amateur radio examination the following weekend (November 10-11), were informed about a training session that had been conducted for some 30 candidates on the previous day and were also notified of RAST's participation in the IARU Region 3 Conference in Vietnam. Speaking after lunch, RAST President Pornchai (Joe), HS2JFW also informed those present about a dinner reception that had been hosted a week earlier for RAST cofounder Ken Irish, W8JVP and his wife during a visit to Bangkok. Joe also mentioned that RAST had started making preparations to celebrate its 50th anniversary in two years' time. Pictured at the IARU Region 3 Conference in Ho Chi Minh City, Vietnam are, from left: RAST Secretary Jakkree Hantongkom (Jack), HS1FVL, RAST Club station manager Dr Noppadol Narupiti (Dr Tong), E20MIO, RAST QSL Manager Chalermpol Muangamphun (Champ) E21EIC and his wife Neeranuch (Goy), E20NKB. 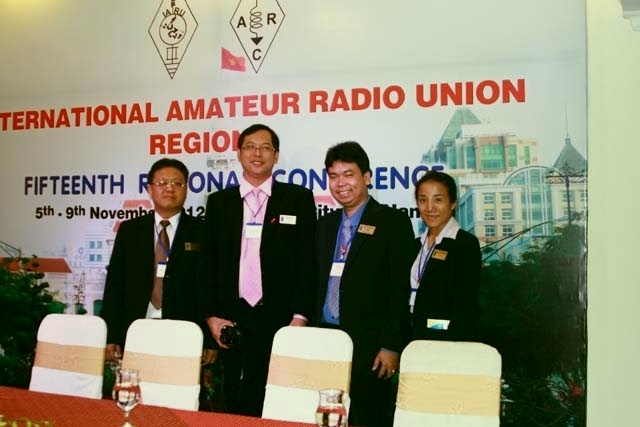 Several RAST committee members were absent from the November 4 meeting since they had already travelled to Ho Chi Minh City to attend the 15th IARU Region 3 Conference which was to begin that evening with a reception. Attending the triennial event are RAST QSL Manager Chalermpol Muangamphun (Champ) E21EIC, his wife Neeranuch (Goy), E20NKB, RAST Secretary Jakkree Hantongkom (Jack), HS1FVL and RAST Club station manager Dr Noppadol Narupiti (Dr Tong), E20MIO. RAST has submitted two papers to the conference, one outlining its activities over the past three years and the amateur radio environment in Thailand and another that provides an account of the first intermediate class amateur radio examination to be conducted in almost eight years. Here is a link to the conference documents. The theme of this year's event is emergency communications and the role of amateur radio in assisting victims of such events as the flooding in Thailand last year and the tsunami off the west coast of Sumatra almost eight years ago. Joe explained that RAST officials were also busy preparing for the second Intermediate Class exam to be conducted this year, having staged a training and preparation session for over 30 candidates the previous day (Saturday November 3). On November 10 and 11 there will be day-long examinations, with Morse Code receive tests in the morning followed by tests sending Morse Code from noon onwards (for those who pass the receive tests). This will be followed by the theory part of the exam which begins at 3 p.m. on both days. Some 120 candidates have registered to sit the exam which will take place at Bangkok University's Rangsit campus on both days and full details can be found on the RAST Thai-language website. 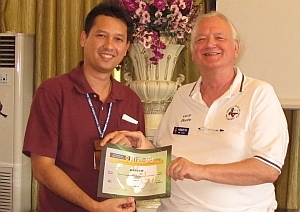 Joe predicted that this exam would mean that there should be between 30 and 40 additional Intermediate Class Thai amateur radio operators who would become active on the HF bands. On May 19, a total of 151 candidates took the first Intermediate Class exam to be conducted in almost eight years and which had been organized and administered by RAST in conjunction with the National Broadcasting and Telecommunications Commission (NBTC). Of these, a total of 42 passed the exam and now hold Intermediate Class licences. The November 4 meeting also welcomed several visiting radio amateurs including Peter Pellack, NO2R and XU7ACY, Ken Claerbout, K4ZW and Nick, DL9BC. The RAST President also notified those present about a welcome dinner hosted by himself and Khun Mayuree Chotikul, HS1YL on behalf of RAST for Ken Irish, W8JVP who had been one of six cofounders of the society in 1964. He had been visiting Thailand with his XYL, Barbara for the first time in 47 years. Photographs of the occasion and additional information can be found below. Joe also reminded everyone that in two years' time RAST would celebrate its 50th anniversary and that committee members had began making plans to celebrate the occasion which would feature a gala dinner, a commemorative handbook and various activities including special-event stations using the callsigns HS50RAST, E2R, E2A, E2S and E2T with a special award for those who contact all these stations. He said that there would also be a Morse code receiving contest with special awards for this. He also asked all members to come up with ideas for different ways that the society could celebrate this event. On October 26, RAST President Pornchai (Joe) Semjang, HS2JFW and former RAST President Mrs Mayuree Chotikul, HS1YL hosted a dinner for one of the founders of RAST Ken Irish, W8JVP and his wife Margaret who were making their first trip to Thailand in 47 years. 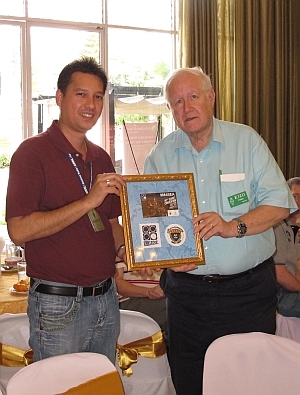 In August 1963, Ken Irish, along with Sangiem Powtongsook, HS1PJ-SK, Col Kamchai Chotikul, HS1WR-SK, Robert Leo, W7LR, Frank Phillips, W5QPH and Jonas Eddy, HS1SD-SK met when they formally decided to establish the Radio Amateur Society of Thailand and proceeded to register the society with the Ministry of Education, setting in motion a process that was finally fully approved in November 1964. 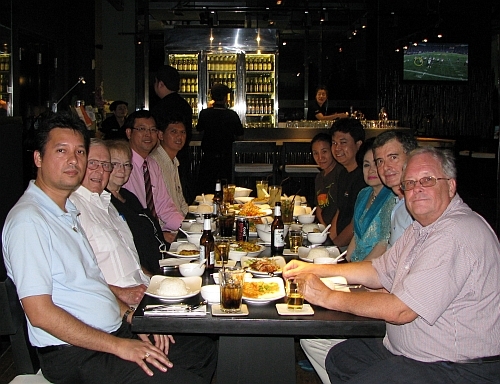 In the picture above, Ken Irish and his wife Margaret are standing next to Mayuree Chotikul, HS1YL (centre) while the others present, from left, are Tony Waltham, HS0ZDX, Svante (Sam) Nordenstrom, HS0ZDY, RAST President Pornchai, HS2JFW, Chalermpol Muangamphun, E21EIC, his wife Neeranuch Muangamphun, E20NKB, Dr Noppodol Narupiti, E20MIO and Watcharapong (Tof) Chujinda, HS0NNU. 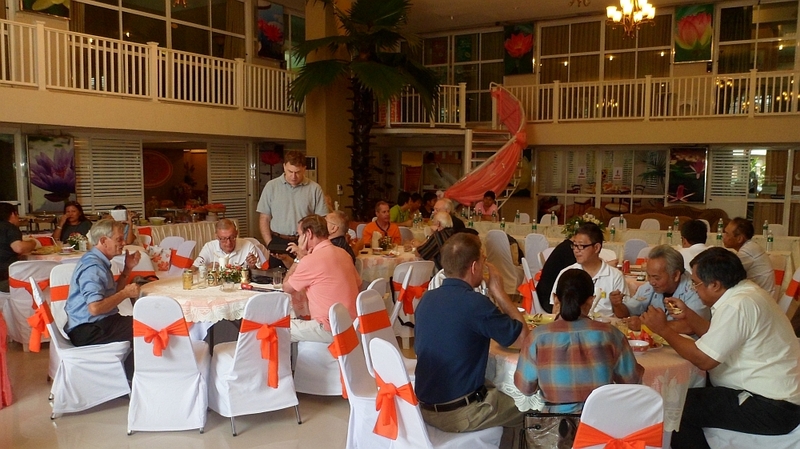 These pictures were taken at the Asia Bar and Kitchen at the Holiday Inn Express Hotel on Rama 1 Road where Ken and Margaret were staying. More details about the founding of RAST can be found here in this account about the history of the society.